I have a new colleague that has been on the job for only a few days. One of the first things he asked me was “what do you do on a daily basis?” My response was “conduct educational programs that better the lives of St Lucie County citizens by transferring UF science-based knowledge.” While this was the textbook answer, its much more complicated than that. Honestly, there has been no “typical” day in my Extension career. This morning was a perfect example. I had to return mosquitoes I borrowed from my colleague Dr. Eva Buckner at the Florida Medical Entomology Lab in Vero Beach. Don’t worry, these mosquitoes were all male, do not bite, were containerized and were used to demonstrate how male mosquitoes play a role in pollination. The Master Naturalist student conducting the presentation was a smash-hit with his fellow students. 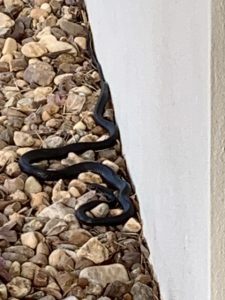 Then when I arrived at the office, as soon as I stepped inside the front door, I was told there was a black snake in the bushes. I rummaged around and didn’t find it. A few minutes later, I heard a knock on the door. There was another snake on the pillar outside the front door. I am the designated go-to person at the Extension office to handle snake-related issues when they arise on our campus. I safely removed a small harmless red rat snake that was trying to warm up between the bricks outside our front door. The little snake is now at a new home in our natural area where it isn’t likely to come into contact with people. I saved the day right? A few minutes later, I got another knock on my door. “The black snake is back.” It was also in the main courtyard and was in a position where it would be visible to visitors. It was also fairly large. While this snake was a harmless black racer, I felt that it would be best if I also moved this snake to our natural area. I used my snake equipment and safely moved it to our natural area. Along the way, I flushed out several bunnies that were bedding down in the bushes. What I did this morning was not something that was in the job description when I was interviewed for the position back in the early 1990’s. Did I improve the lives of St Lucie County residents…yes. People with ophidiophobia (fear of snakes) were not going to come into contact with these snakes when visiting our office. 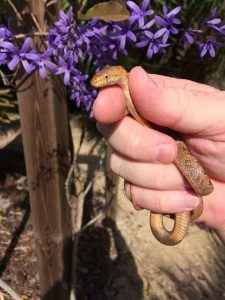 I am also using this as a teachable moment to share the UF/IFAS information about snakes. Ken Gioeli Extension Agent IV/Natural Resources - UF/IFAS Extension St Lucie County. 772-462-1627 ktgioeli@ufl.